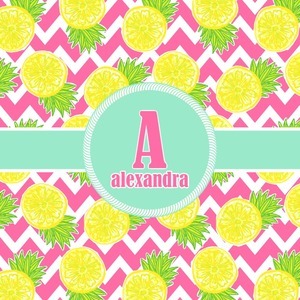 The coordinating design has a large, bright pineapple on the left side with a mint ribbon running behind it. On the right side of the ribbon is the personalized text. The background is a bright pink and white chevron. You are sure to be noticed with this bright design! Be sure to change and personalize whatever you wish! Check out different patterns, fonts, ribbons, and more within our system. If you need any assistance just give us a call!